The latest release in the Shadepoint Cycle is out now! Deep in the mines of Shadepoint, workers toil without light, space, or fresh air, labouring under the constant threat of collapse from above – or lurking horrors from below. Fortunately the bards of the College of Cadence are there to lift morale – and the visit swift justice upon the many-fanged threats from the deeps of the earth. The College of Cadence is a new bard college designed to be used with the 5th edition of the world’s most popular roleplaying game. It is designed to be used with the free supplement Cities: Shadepoint but is not dependant on that setting, and will work easily in any traditional fantasy campaign. A balanced bard college – the College of Cadence. Three new characters backgrounds – The Advisor, the Miner, and the Treasure Hunter. Three pregenerated characters, presented on gorgeous sheets designed by Emmet Byrne. A brief history of the College of Cadence, designed to make it easy to introduce this new kind of bard to your games. 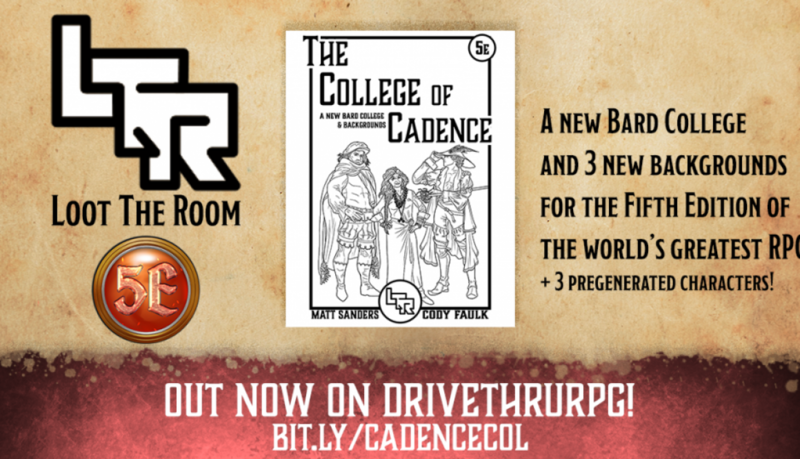 Get the College of Cadence from DriveThruRPG now! Matt Sanders kindly stepped in to write a guest post this week, as I’m deep into finishing off the next release in the Shadepoint cycle. With no further ado, I’ll hand you over to him! Undead creatures in RPGs are typically sword-and-spell fodder, and only a few types of undead get developed into having any kind of personality. That’s usually liches and vampires as significant villains or antagonists. 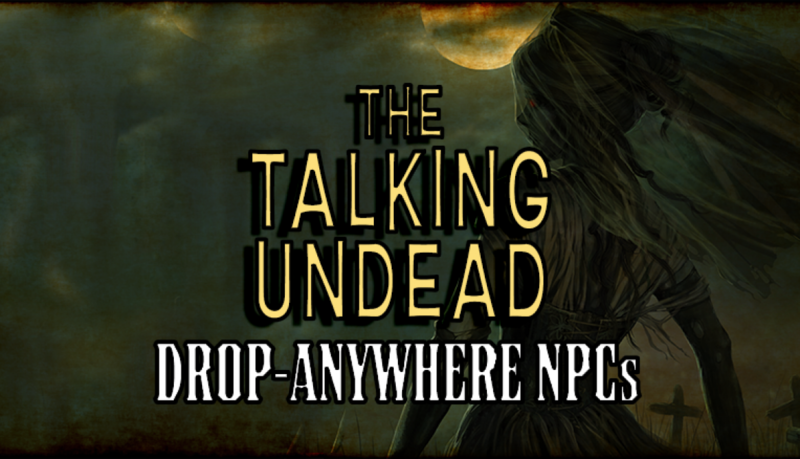 Today’s post is about adding some of that undead flavour to NPCs that your party will be able to have some proper social interaction with. All of these should fit into most settings without major tweaking. Simply roll a D10 or choose one that suits. This forked tree holds an ancient skull that was jammed into the fork many years ago. It’s the skull of Toldren Cumberle. His moss-covered skeleton lies slumped a few feet below the head, tantalisingly close to being reunited. His favourite pastime is to wait until someone passes and hurl expletives and curses at them. This shuffling zombie has been dead so long, and reattached so many parts of his body himself, that he’s become quite the expert surgeon. He can clean and stitch up wounds well beyond the skill of most. He answers to Anton. This ordinary-looking coffin is mainly notable for the muffled voice coming from within. Inside is the fresh corpse of Morgan Druffield, who was until recently the village’s oldest man. He mostly just wants to talk about the old days to whoever will listen. This group of stray dogs was poisoned, but they failed to move on to other planes. A crust of green foam still hangs around their mouths. One of them carries a bone which you are fairly sure is from his own leg, given how he hops along. They’re glad to see anyone who will pay attention to them, and can perform quite a lot of tricks. This veiled seamstress works all through the night, sewing the clothes of all who bring things to her in need of repair. She seeks to atone for perceived wrongs she did when living. During daylight, she sits and waits. This forlorn-looking wight shuffles around the docks, staring out to sea, his cutlass hanging limply at his side. A trail of ethereal grog bottles lies where he has been, and his speech is slurred and repetitive. “They only went and bloody left me,” he mumbles under his breath every few seconds. This spectre of a young woman is stuck in a loop, walking the same path again and again, disappearing at its end, and reappearing back at its beginning, only 30 feet away. As she walks, she pauses and looks at those who pass, lacking the confidence to speak up. Each time she reaches the end, she drops her hood and you can momentarily see her eyes are gone and her cheeks have been cut open, the flesh flapping around in grisly flaps. This cheeky spirit likes to flit around bodies of water, looming up at the faces of those who pause and glance down into the water, distorting it’s translucent face into disturbing grimaces and then breaking into giggles when the onlookers recoil in horror. The spirit is playful and always up for suggestions of what it sees as practical jokes. This headless skeleton rifles through garbage piles wherever it can find them. This often takes some time, as it has to stumble around, feeling its way around. Bizarrely, it does seem able to hear, and responds to people speaking to it well enough. Presumably, it’s looking for its head. This fearsome, matronly-looking woman bellows at the top of her lungs, calling the names of her three children in turn. “DERRRRREEEEKKK! LLLOOOORRRNNNAAAA! KAAAAAYYLLLEEEEBBB!”. When they don’t appear, she moans to whoever will listen about how they’re always pinching things and causing trouble and that she’d pay someone to bring them back. You can find Matt on Twitter as @iammattsanders, and you can find his work on DriveThruRPG here. 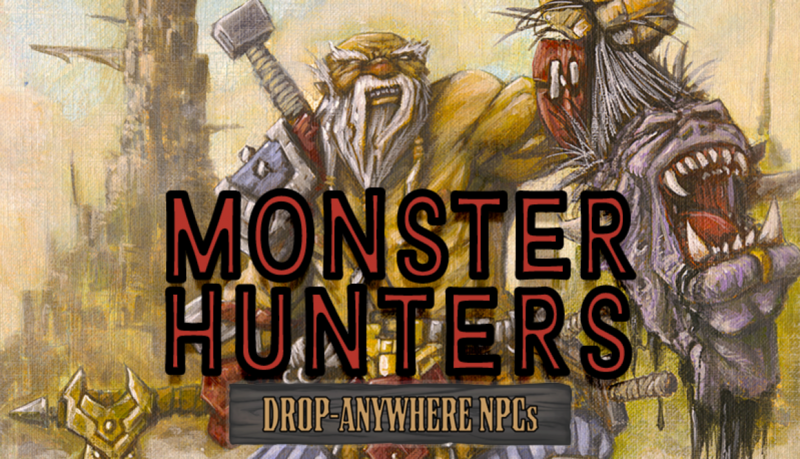 And one final thing – last month’s PDF of Monster Hunters is now available for free from DriveThruRPG! Get it here. Loot The Room is expanding! It’s been a hectic couple of months here at Loot The Room, with a lot going on behind the scenes. I still can’t talk about all of it, but today I can finally announce something I’m really excited about. Let’s not bury the lede: I’m very excited to announce that Loot The Room is expanding, and am happy to welcome Matt Sanders (@iammattsanders) to the team..
Long-time readers of Loot The Room will recognise Matt’s name. As well as having written guest posts here in the past, Matt’s work as Dwarves in a Trenchcoat has been regularly featured in the monthly Best of DMs Guild roundups. I’m a big fan of his work, and I’m really excited to take this step forward and begin collaborating with him more regularly. We have a number of exciting projects in the pipeline, some of which you’ll be hearing about very soon. For now, we’re re-releasing Matt’s Bags of Flavour products as a part of the LTR line under a Pay What You Want model, beginning with the first book Trinkets – Books. If you haven’t already checked out Matt’s work, now is the perfect time to start! You can name your own price for Trinkets – Books right now from either DriveThruRPG or Itch.io! We’ll have more to announce in the coming weeks – including the release of Matt’s other Trinkets books Adventurer’s Gear, Bottles, and A Miscellany – and I’m thrilled to embark on this new chapter for Loot The Room. Watch this space for more news, and become a Patron to be the first to know about everything that’s going on! Jungle Goodies is out now! Jungle Goodies is now available on the DMs Guild! Tired of handing out the same old loot? 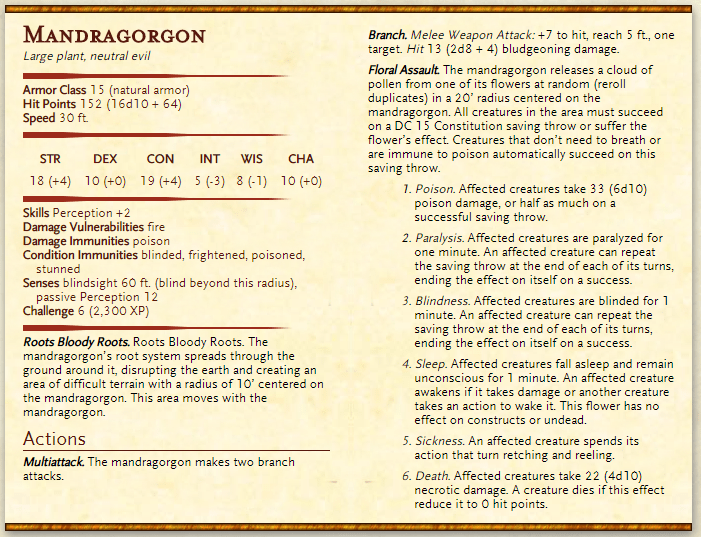 Are your players heading to Chult expecting weird new monsters and treasures? Don’t worry, we’ve got you covered. Loot The Room and Dwarves in a Trenchcoat are proud to present Jungle Goodies, a collection of trinkets, plot hooks, locations, NPCs, and plenty more, all designed to fit seamlessly into Tomb of Annihilation or any other jungle-based campaign! Whether you use while you’re planning your next adventure, or else keep it to hand at the table for those times when you just need a random list, Jungle Goodies is there to help inspire you and fill your game with a ton of weird and unique new items and places! Breaker of Chains is out now! Remember how I said my last post was full of good advice that I’d inevitably ignore? I’ve gone and done it again. I couldn’t wait until Thursday, so Breaker of Chains is available now on DMs Guild! There’ll be a Stat Boost post later this evening, where I’ll talk about laying out your adventure on a budget and some of the last minute things you’ll need to account for before publication. Those things take up a surprising amount of time – one of the reasons today’s post is later in the day – and things will go much, much smoother if you prepare for them in advance. Until then, check out Breaker of Chains and let me know what you think! For the past few months I’ve been working on a few secret projects that I haven’t been able to say much about. One of them finally came out yesterday, which means I can finally talk about it. So here we are with a post on a Saturday. Isn’t that novel? Mini-Dungeons #1: Caves is the first in a series of 3 collaborations with PB Publishing, presenting 3 new mini-dungeons that can work as both stand-alone side quest adventures or work together in one short campaign arc. Phil and I worked together on designing the dungeons, then he handled the writing and I drew the maps. I’m really happy with how this first one has come together, and I’m really excited to share it with everyone. It’s been an absolute pleasure to work with Phil on these, and I’m already looking forward to the next book being released. 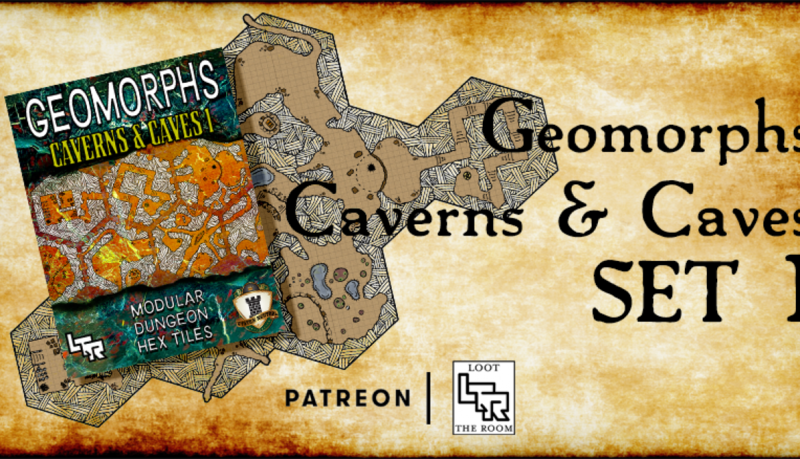 Each one will tackle a different terrain type – the sharp-eyed among you will have already figured out that this one is all set in caves – and the intention is to produce a series of small adventures that are really easy to drop into your ongoing campaign. I think we’ve achieved that, and I hope you’ll check out this first book and let me know how you feel about it! It’s been a lot of work, but Bulette Storm – my first Patreon-funded free adventure – is now available on DMs Guild. On Friday I put up quite a lengthy article in which I discussed the issues I see with the current state of RPG publishing, and the few innovations I was hoping to bring to the table. It sparked a lot of discussion. I’m not going to respond to any of that here, because frankly I’m exhausted. Instead I’m going to briefly talk about what I’ve learned from putting the interactive version of Bulette Storm together. The first thing to say is that without a significant improvement to my workflow for putting these things together, it isn’t really feasible to do something like this again. I wish I’d started with a much simpler site-based adventure – a basic dungeon crawl, for example. That kind of adventure would work perfectly with what I’ve attempted to do; the investigative parts of Bulette Storm presented soemthing of a challenge. At a conservative estimate, I’d say I’ve spent about 30 hours putting the interactive version this adventure together. That doesn’t account for time spent writing the thing in the first place, or producing maps, sourcing other artwork, and laying out the A4 and Letter-formatted versions. That’s an obscene amount of time to spend on producing a 26 page adventure. I’m very confident that the next project I attempt like this won’t take anywhere near that amount of time, because I had to learn a lot about Acrobat and InDesign while I was working on Bulette Storm, and I had to lay out each page from scratch. Now that I’ve done one project like this, I know what kinds of things will and won’t work. I still don’t have page templates set up for myself – I’m not sure that’s feasible for this kind of layout – but the next time I come to do this, I’ll be able to start thinking about page layout as I’m writing (and writing with layout in mind, too). I think one thing that will greatly speed up this process is by designing templates for types of encounters. I have some thoughts on that, but I’ll wait until I have a bit more time to experiment with them before I talk about them. Bulette Storm is free, and I’d really like it if you’d download it and at least give it a look to see if you think this kind of formatting is of any use to you. If you don’t like it, that’s fine – the adventure is presented in a traditional format as well. Feel free to get in touch about it, either in the comments here or the discussion tab of DMs Guild (or via email), and if you feel like leaving a review I’d appreciate that, too. Patreon funding has dropped below $100 this month, so there won’t be another free adventure until we get back up there. And honestly, that’s fine – this was an exhausting process, and I need some time to decompress from it. Oh, and the normal Monday Map will be up either tomorrow or Thursday, depending on when I get the time to do it.